UM commits DE Taco Charlton and QB Shane Morris. Via Shane Morris' Twitter feed. A much larger and more informative post will be forthcoming, but I just wanted to let ya'll know that we're paying close attention to what could be, and probably already is the biggest and best single recruiting day, aside from a national signing day, that I can remember. The brand-spanking new 2013 recruiting board lives here. Each is by-in-large a 4-star recruit. Some don't have ratings on some sites yet, but are 4-star on other sites. 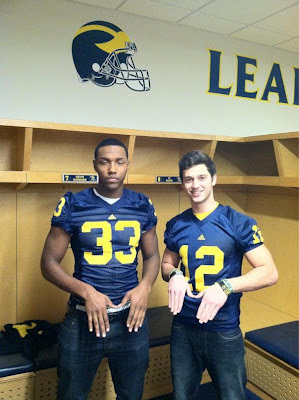 So basically, Michigan's added 24 stars to the 2013 class in one day. What a day. Oh yeah, and #19 Michigan basketball beat #6 Ohio 56-51 in primetime, and Michigan hockey beat Northern Michigan 3-2 in overtime.